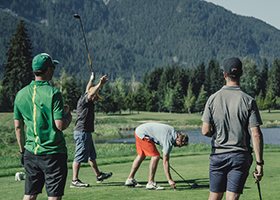 KELOWNA — Jared du Toit and birdies just seem to go together at Gallagher’s Canyon Golf & Country Club. Playing in the final group of the day at the GolfBC Championship, the 23-year-old second-year pro from Kimberley shot a five-under par 66 Friday to grab the 36-hole lead at 11-under par. Du Toit, who set a course record at Gallagher’s Canyon last year when he fired a 10-under par 61 in the third round of the GolfBC Championship, had seven birdies and two bogeys in his round Friday that was played in blustery conditions. He has a two-shot lead on five players — Zach Wright of Baton Rouge, La., Brinson Paolini of Virginia Beach, Va., Jeremy Paul of Germany and Californians Mark Anguiano and Corey Pereira — who sit at nine-under par on a very crowded leaderboard. Taylor Pendrith of Richmond Hill, Ont., is also in the mix, three shots back at eight-under. It should make for an exciting weekend at the $200,000 Mackenzie Tour-PGA Tour Canada event. Du Toit finished his round with a nice up and down out of a greenside bunker for birdie on the par 5 ninth hole, his last of the day. Du Toit has liked the trajectory of his game of late and likes his chances this weekend. “I have been playing well for a while now and it’s finally coming together, I think,” he said. “If I just stick to it, I like my chances. A Canadian has not won on the Mackenzie Tour in more than two years. “I have heard rumblings about that,” du Toit said with a smile. Meanwhile, the big-hitting Pendrith wishes he could use his driver a little more often at Gallagher’s Canyon. Pendrith only pulled it out of his bag twice Friday and made eagles each time on the par 5 sixth and ninth holes. That helped the 27-year-old post an eight-under 63 that vaulted him up the leaderboard. Pendrith’s round could have been even better. He was eight-under through his first 12 holes Friday, but double-bogeyed the par 3 13th hole. Gallagher’s Canyon demands precision off the tee and that’s why so many players, particularly the big hitters like Pendrith, leave the driver in their bag. Pendrith is delighted to be where he is considering where he was 13 holes into his first round on Thursday. Pendrith, who is playing on a sponsor’s exemption, has battled injuries in the last year or so. Texan Sam Fidone, last week’s winner in Victoria and the current Mackenzie Tour Order of Merit leader, finished strong Friday to make the cut, which fell at three-under par. Fidone, who started his round on the back nine, birdied No. 7 and then eagled his final hole, the par 5 ninth, to shoot a three-under 68 and finish 36 holes at four-under. Joseph Harrison of Las Vegas aced the 187-yard par-3 third hole. It was Harrison’s first career hole-in-one. “It has been burden on my shoulders for a long time, so it is pretty awesome to get it,” said Harrison, who shot a three-under 68 and sits at seven-under through 36 holes. Other Canadians making the cut Friday included West Vancouver’s Dave Rose, the 2011 B.C. Amateur champion who sits at six-under par. Vancouver’s Stuart Macdonald and James Seymour of Aurora, Ont., (both five-under) and Ryan Williams of Vancouver (four-under) will also play this weekend. The leaders will tee off at about 1 p.m. on Saturday with play starting at about 8 a.m.